Product #1490 | SKU VHUBUV/IF/OPT | 0.0 (no ratings yet) Thanks for your rating! 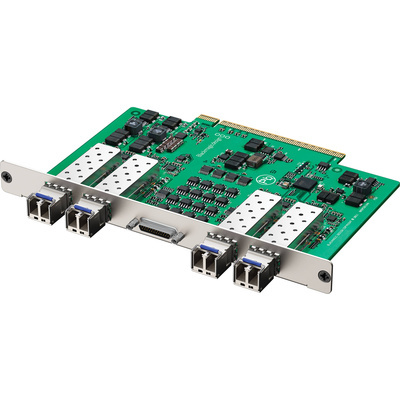 The Universal Videohub Optical Fibre Interface is a hot-swappable card module designed for use with the Videohub 72 and 288 rack frame routing switchers. It includes 4 inputs and outputs as well as a port for remote control of up to 4 decks. Other features include built-in SDI re-clocking, SD/HD/3Gbps auto-switching, 1310nm laser drivers, and receivers with a 25km range at 3Gbps.